Creating sustainable ways to fund robust housing plus services models for all providers is still a challenge that has not been met, but LeadingAge members are nonetheless doing remarkable things in bringing services to residents. With good reason, the aging services field (and LeadingAge in particular) have identified housing plus supportive services as a promising model for serving low- to moderate-income seniors, keeping older adults independent while keeping health care costs affordable. The problem is that a reliable way of doing so—a way that most housing organizations, including the smallest ones with few resources might be able to put into practice—is likely to be very difficult. To better understand the challenges of finding a sustainable model for housing plus services, see the article, “Taking Steps Toward Financing Housing Plus Services” by Alisha Sanders of the LeadingAge Center for Housing Plus Services. That bootstrapping approach, however, can be surprisingly effective, even if provision of health services can’t be as robust as desired. We spoke to a group of housing providers who have taken different routes to housing plus services. Some have foundation support or rely on a faith community to help fund their activities; others are very successful fundraisers; and all of them bring creativity to bear for the benefit of residents. Regardless of size, you can be sure that every housing organization’s offerings include a component of wellness in some form. Even a small provider with few employees or resources will typically offer activities—exercise classes, health screenings or vaccination programs—with wellness at their center. Some housing providers have made wellness central to their identities. Eaton Senior Communities, Lakewood, CO, adopted a philosophy of wellness 8 years ago. 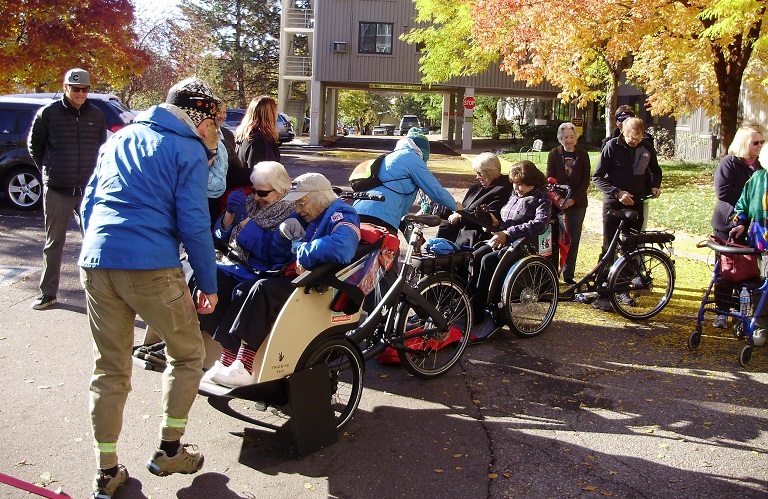 The Cycling Without Age program was launched by Eaton Senior Communities in partnership with the City of Lakewood, CO. Eaton was awarded the City of Lakewood Community Sustainability Award for this initiative. Photo courtesy of Eaton Senior Communities. Eaton’s property is HUD-subsidized, with a project-based contract, and houses 164 residents, all of them income-qualified. “We had always had a component of services,” says President/CEO David Smart, “but once we dug into it, we learned there was a whole lot more we could be doing.” Smart notes that Eaton’s commitment to wellness is a direct outgrowth of Delgado’s participation in the Larry Minnix Leadership Academy in 2010. Eaton’s wellness focus began with the hiring of a half-time wellness nurse, funded by a grant. When budgets allowed, Sarah Schoeder, an LPN who is the current director of wellness, was hired and, says Smart, the program could take off. Evaluation will play a part in Eaton’s wellness programming. The University of Denver (DU) is doing a project to measure the effectiveness of the health and wellness program, and in particular, the residents who are coached. The researchers are using the REACH (Residents Engaging in Authentic Conversations on Health) tool, which DU developed to measure the effectiveness of Eaton’s programs and to assess the health and wellness of residents, and also collecting biometric measurements. Delgado says all participants in the coaching sessions will complete pre- and post-coaching surveys as well. Lots of partnerships make the wellness program work. A program called HealthSET, provided by Centura Health’s Community Health Improvement department, sends volunteers and staff nurses each month to give free health screenings and to connect residents to their primary care providers and other resources. United Health Group, through its Optum “health services platform,” provides a registered nurse and a nurse practitioner who come on-site at least once per week to see its clients. Physicians and nurse practitioners are also on site every day, provided by house call groups in the Denver area. Eaton provides a wellness room used by a variety of providers—a dental hygienist, podiatrist, dermatologist, audiologist and more. A physical therapy group pays rent to maintain an office on-site. The service coordinator makes sure residents are connected as needed to whatever providers they need. Smart says that Eaton sometimes reaches out to new potential partners as needs arise, but often it’s the providers who call Eaton. “It’s a win-win because service providers have a ready-made patient base here. It’s good for residents; the providers bill insurance, they don’t have to drive anywhere,” says Smart. “We bring in massage therapy, tai chi and acupuncture. People like that come in and offer a reduced rate because they can see a lot of people at one time. They understand our mission and who we’re serving. Delgado notes that providers have altered some typical practices in order to make their work more affordable for this low-income population. Massage therapists, for instance, have agreed to see people in 15-minute increments to make their services more affordable, and the acupuncturist has developed a group session for residents, which helps keep costs low. Smart looks forward to the completion of the research project, to have a better handle on how much money these services, by minimizing hospitalizations, can save. There is some data available now from Dispatch Health, an on-demand urgent care company that Eaton works with, showing that Eaton residents saved $85,000 in the first quarter of 2018 by avoiding ER visits. New York City-based Selfhelp Community Services is also studying the salutary effects of wellness programming. Selfhelp has 27 sites serving 20,000 New Yorkers. Its affordable housing branch serves 1,400 older adults in Queens, the Bronx and Nassau County, in 10 buildings. Selfhelp Community Services has a wellness orientation, and offers an array of services it calls SHASAM (the Selfhelp Active Services for Aging Model). Photo courtesy of Selfhelp Community Services. Screening, forms completion, and advocacy for many entitlement and benefits. Wellness programs including exercise, stress management, pastoral counseling and falls prevention education. Health screenings for vision, hearing, foot care, gait/balance, memory loss and mental health. Referrals to partners for home care, meals on wheels, housekeeping, Holocaust survivor services, adult day programs, senior centers, geriatric care management and more. Technology, including telehealth kiosks, a computer lab, Skype, cognitive fitness exercises, its well-known Virtual Senior Center and personal emergency response systems. Socialization events: holiday and seasonal celebrations, birthdays, and other activities. According to Sandy Myers, vice president, external affairs and communications, Selfhelp recently completed a 3-year study, focused on health care savings and health care utilization for a subset of Selfhelp residents in Queens, compared to older adults from the same zip codes. The study was done by Dr. Michael Gusmano of Rutgers University, who concluded that Selfhelp residents were less likely to be hospitalized, less likely to visit an emergency room and more likely to use health care appropriately. In addition, Medicaid spent less money on Selfhelp residents. See more detail on these findings here. The 2 buildings of the Crown Center for Senior Living, St. Louis, MO, house 275 people in 244 affordable apartments, 75% of them subsidized. Founded in 1967 by the National Council of Jewish Women, the organization was committed from the start not only to housing but “being helpful to older adults, beyond housing,” as Executive Director Nikki Goldstein puts it. to residents. Photo courtesy of Crown Center for Senior Living. Goldstein says the original model was heavily volunteer-driven, but Crown Center now has a staff of 25 and partners to bring in a broad array of services, with a strong element of—no surprise—wellness. 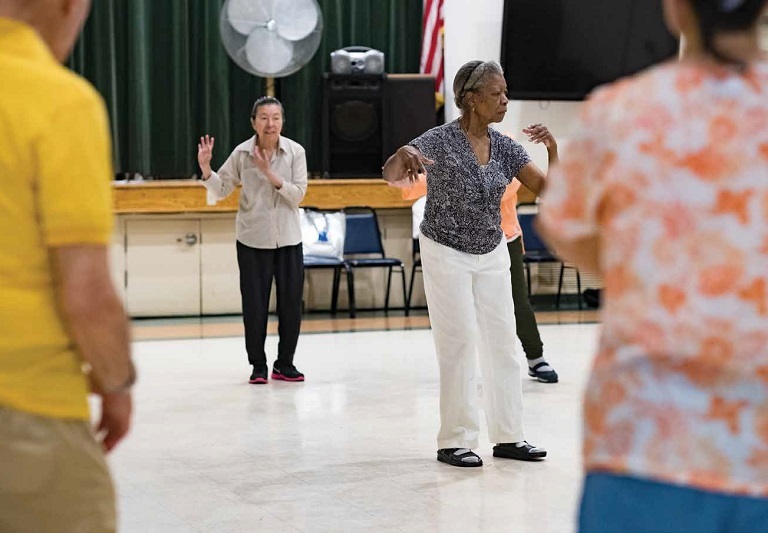 The organization is a senior center and resource, welcoming older adults from the surrounding area to participate in programs along with residents. It also serves as a senior center site for Aging Ahead (formerly the Mideast Area Agency on Aging). It offers congregate meals 5 days a week (including kosher options), and volunteers also deliver meals to homebound people in the area. Crown Center’s café is open daily, and each evening is turned back into the community’s dining room. The café is open to the community, so people of all ages gather there, and uses produce and herbs grown in the community garden. The organization also partners with local colleges and other entities to provide health screenings of all kinds, exercise classes, music programs, talks on popular topics, and more. All activities are also open to people from the surrounding community. At the Park Danforth, Portland, ME, partnerships with local universities have brought some programs to residents, and Chief Operations Officer Lisa Noonan says the organization is looking for partners to help bring in more health services, such as physicians or nurse practitioners on-site, or perhaps a telehealth program. One partnership with a local university is now bringing student wellness coaches onto the campus to work with residents. Noonan was inspired, as a fellow of the Larry Minnix Leadership Academy in 2015, by a visit to a provider in Detroit who successfully convinced the city and local health organizations to bring a registered nurse into the community as a way to reduce ER visits. which. Photo courtesy of The Park Danforth. The Park Danforth is an affordable housing provider, but also offers market-rate housing and has successfully mixed the 2 categories for years. Out of its 216 independent living apartments, 110 are market-rate, and 21 of its assisted living units are market-rate as well. Seventy HUD Section 8 apartments and 15 Medicaid (MaineCare) assisted living units round out the inventory. Most of The Park Danforth’s 90-plus employees are part-time; the community runs its own dining programs. Its newest building, completed in 2016 and including 58 apartments, also includes a “Main Street,” which has a wellness center, bistro, pub, salon, theater and an auditorium and other meeting spaces. In Asheville, NC, Givens Communities is building a similar model with its new Givens Gerber Park campus. The third of the 3 Givens Gerber Park buildings, 60 Gerber Road, is scheduled to open in June with 82 units with supportive services for seniors with modest incomes. The other two buildings are limited to people at 60% of area median income (AMI) and below, with set-asides for 30% and 50%. Income limits are $25,800 for one person and $29,460 for 2 persons. One building includes 78 HUD-subsidized units; the other is tax-credit financed and not subsidized. The newest building is designed to meet the needs of seniors who are over the income limits for HUD and tax credit housing but unable to afford more traditional retirement communities. Teresa Stephens, Givens’ affordable communities director, says the organization’s own history in a group of older, HUD 202 buildings showed the cost-saving benefits of the right kinds of services. The decision to build Givens Gerber Park arose when it became clear that the older buildings could not be brought up to modern standards and would have to be torn down. 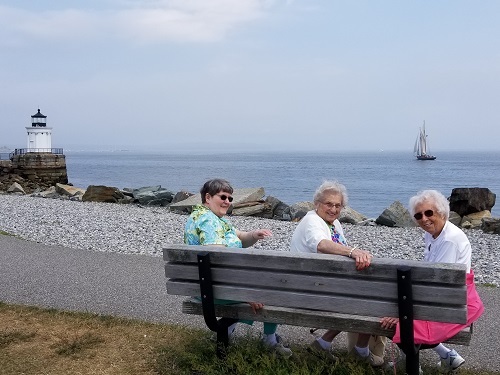 “By that time, LeadingAge was leading the way in calling attention to housing plus services, and we paid attention to the SASH program in Vermont,” Stephens adds. Residents in the newest building pay a small nonrefundable buy-in fee, in the range of $6,500 to $15,000 and a monthly fee based on their income level. “That monthly fee includes everything—rent, water, electricity, trash, cable TV, a land-line phone, internet, and a modest amount to use in the café,” Stephens says. (The café, like Crown Center’s, is roughly modeled on the Mather Café Plus.) The buy-in fees allowed creation of the café, and a partnership with a local nonprofit to bring a primary care clinic onto the campus. Stephens adds that once residents are on the new campus, if their income changes and qualifies them for affordable housing, they can be moved into one of the tax credit apartments as soon as one becomes available. “We have social workers and a community nurse, and we’ll do what we can to help you,” she says. Affordable housing does more than provide a shelter. A sense of community is valuable to residents, most of whom are single, and is especially important to immigrants and other underserved populations. In Seattle, Kawabe Memorial House features a large number of first-generation Asian immigrants, largely from Japan, Korea and China, who do not speak English. According to Executive Director Connie Devaney, all communications (written, verbal and meetings) are translated into Japanese, Korean and 3 Chinese dialects. As with the other housing providers we spoke to, partnerships do heavy lifting when it comes to service provision. Dozens of community groups come in to offer classes and activities. 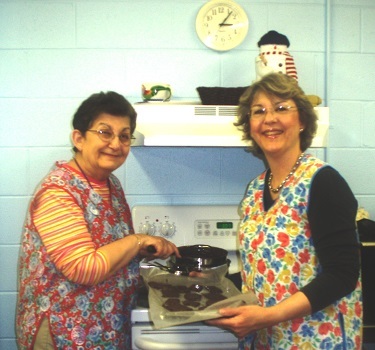 Kawabe House is an International Nutrition Site, offering a Title III Older Americans Act congregate meal program with a daily lunch program for residents 60 years and older. Kawabe Memorial House’s annual Community Street Festival is open to the public every August and brings in needed funds for the community. Residents have a major role in putting on the many events. Photo courtesy of Kawabe Memorial House. 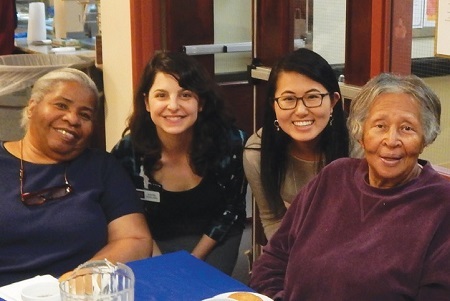 One partner, Sound Generations, provides Meals on Wheels, transportation and fitness programs, and contracts with Kawabe to provide the daily lunch program. Other fitness programs are offered by the International District Health Clinic. The National Asian Pacific Islander Center for Aging provides staff for some meal programs. At Selfhelp, like Kawabe, most housing residents’ first language is not English. Multilingual staff serve people speaking Chinese, Korean, Russian and Spanish. Language line services are available in all buildings, so any worker can use it to communicate with any resident. Interns brought in from local schools are, whenever possible, bilingual or multilingual. When funding allowed telehealth kiosks to be brought into one site, Selfhelp arranged for them to offer Chinese, Korean, Russian and Spanish translations. That multilingual commitment extends to Selfhelp’s technology initiatives. Telehealth kiosks in one site offer translation into 4 languages. Selfhelp’s celebrated Virtual Senior Center is now available with original content in Mandarin, Korean, Russian and Spanish. Housing providers are always looking for ways to raise extra money to help residents, fund improvements or add new programs. The Seymour I. Hollander Apartments in Bridgeport, CT, sponsored by the Greater Bridgeport Jewish Housing Corporation, is an example of many LeadingAge member housing providers: a small organization (about 100 residents) that must watch every penny, and yet manages to bring valuable services and activities to residents. A mortgage refinance in 2012 moved the building from a 202 to a 223f; it enabled refurbishment of all apartments with new cabinets, carpet, thermostats and bathroom upgrades. The Hollander Apartments offer residents Tai Chi and armchair exercise programs; music therapy and music appreciation presentations; art projects; brain training; summer barbecues; transportation to stores and tourist sites provided through the city; fully catered Thanksgiving dinners; and more. Executive Director Marjorie Worman Rosten leads a staff of 5, and thinks of her staff as facilitators. An active board helps; all its members are frequently on-site and volunteer their time. Examples include, but are not limited to, one board member who leads art projects, another who helped find the right contractor to install all new security cameras, and another who serves as a certified Medigap counselor. For others, connection to a foundation or a generous religious community helps bring in the funds that allow greater service to residents. Episcopal Place, Birmingham, AL, was founded by the Episcopal Diocese of Alabama in 1979, and the Episcopal Communities Foundation helps make a variety of complimentary services available to residents. According to Executive Director Tim Blanton, foundation funds cover medical transportation (which includes a full-time driver and the leasing of 2 vehicles) 3 days a week and shopping trips on the other 2 days; a fully stocked food pantry, a part-time chaplain, a part-time activities director, housekeeping services to those residents who can’t afford it or physically do it, and subsidized noon meals. Episcopal Place has a very successful history of fundraising. A grant from the Community Foundation of Greater Birmingham helped it hire its first development director 8 years ago and funded the position for one year. Today, says Blanton, the organization raises $250,000 or more each year. One important component of the fundraising, the annual Gumbo Gala, traces its origins back to Hurricane Katrina. A group of Louisiana residents lost their homes in the hurricane and moved into Episcopal Place. Staff members came up with the idea to launch the Gumbo Gala, which is open to the public, to make them feel at home. Today the event raises about $100,000 annually. “We have a fund called our financial assistance/resident relief fund,” says Blanton. “It spends about $8,000 to $12,000 per year helping [residents] with copays, dental bills, moving expenses, utility deposits, groceries, etc. Episcopal Place has a long history in Birmingham, and with the support of a generous religious community, good fundraising and a relatively high local profile (including a prolific social media presence), can offer many things to many residents. Kawabe House also has an annual public event that raises funds. Its Community Street Festival is held in August. 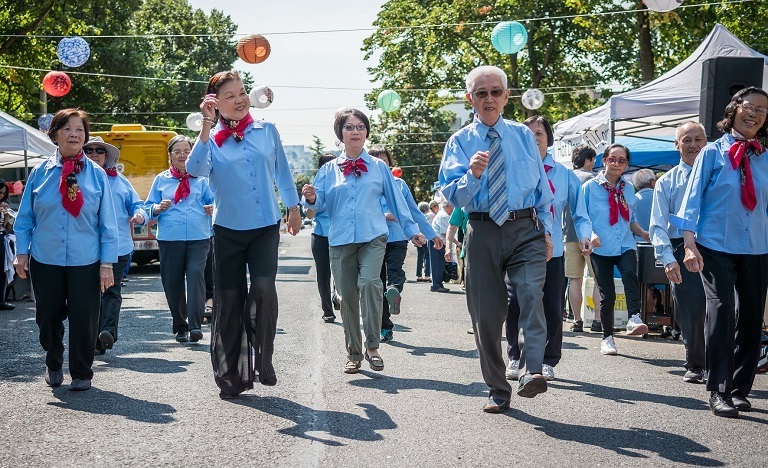 The event is planned and implemented by the board of directors, and the residents plan the food booths, games, crafts and traditional dances and songs, Tai Chi demonstrations and Line Dancing. It draws hundreds of people. Kawabe has established a separate foundation, with a different board, to manage fundraising. Recent upgradess to the building, including creation of some common areas, a gym, beauty salon, acupuncture and massage clinic, and the purchase of a new van, were accomplished with Festival proceeds, which are not used for ongoing costs. Crown Center also has a successful fundraising program, bringing in more than $1 million annually, which helps in maintaining the large staff and service menu. The organization also budgets money for direct financial assistance. Goldstein notes that the money saved by being self-managed goes into services as well. Bringing health care into affordable housing is on the wish list for many providers but can be difficult. In the Boston, MA area, Jewish Community Housing for the Elderly (JCHE) offers CaringChoices™, a HUD-sponsored Congregate Housing Services Program (CHSP). JCHE’s Ulin House and Leventhal House were covered by the grant, and later, says Silverlieb, Kurlat House was allowed by HUD and the Massachusetts Housing Finance Agency (MassHousing) to join the program. The latter property is partially funded by HUD, and there is a community match. CaringChoices provides home health aide services 24/7. The aides are contracted from an outside company, and have been for the life of the program. “The residents who take advantage of this, for the most part, are clients of the gatekeepers, but we still will service them,” Silverlieb says. The program serves 80-90 people per year, but fluctuates. On average, 45-50 residents are served at any given time. Because JCHE is a multicultural community, Russian-speaking and Chinese-speaking aides are on staff. A program manager is responsible for case management, supervision of contracted staff, and communication with all parties. “It’s not uncommon for an aide who is providing service to a resident, regardless of what agency he or she works for, to visit [the program manager] and say, ‘This resident really needs more assistance,’” says Silverlieb. For providers who are not grandfathered into something like the CHSP, what would it take to implement something similar?